In 2017, The Campaign was pleased to partner with UNAIDS in hosting a series of high-level meetings centered around the achievement of the 90-90-90 goals bolstered by expanded human resources for health throughout Africa. This position became an official Decision Point of the African Union in July 2017. With an additional investment in community health workers, not only could primary healthcare be expanded throughout the continent but the continuing threat of major infectious diseases – such as malaria, tuberculosis, and HIV/AIDS – could be eliminated by 2030. The Campaign in collaboration with the Ghana Ministry of Health and Ghana Health Service convened a National Forum on Information and Communication Technologies (ICTs) for Health and Development from 27- 29 June, 2016 in Accra, Ghana. The event brought together over one hundred ICT and sustainable development experts from Ghana, USA and India to share experiences and explore ways to converge and scale-up ICTs in the health system to help achieve Universal Health Coverage and to contribute to the other Sustainable Development Goals (SDGs). 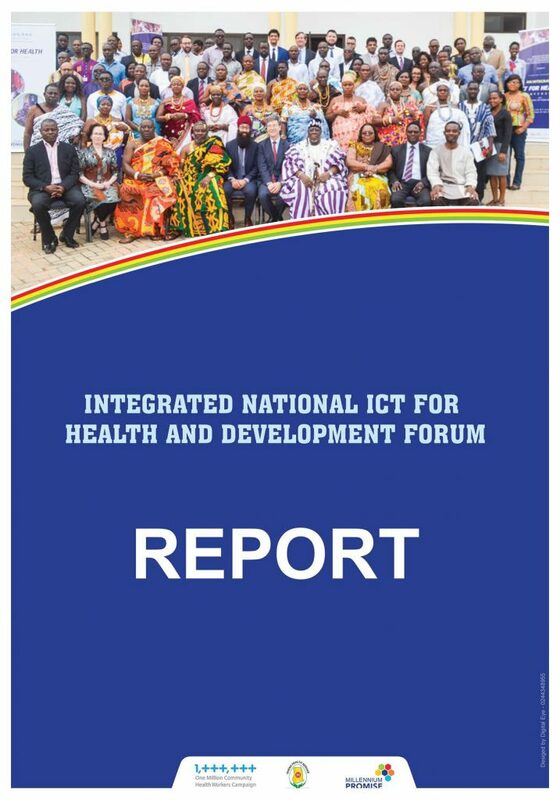 The forum reviewed all current proposals on integrating mhealth and other information technology for unique identification in Ghana’s health sector, which is contained in this report. 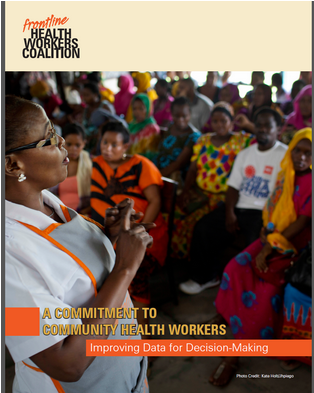 This report is the result of the 1mCHW Campaign’s collaboration with mPowering Frontline Health Workers on the Data for Decision-Making Series, that discussed the importance of data on CHWs to help achieve the Sustainable Development Goals. 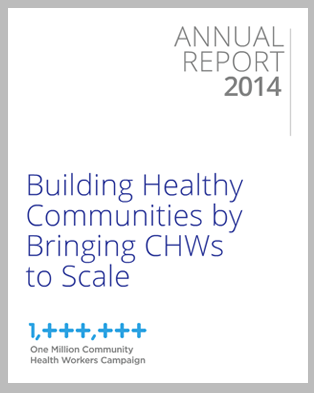 The 1mCHW Campaign’s 2014 Annual Report provides a comprehensive overview of the Campaign’s work and identified next steps and key priorities for 2015. 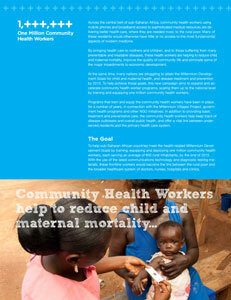 Great variation in the scope of practice of CHWs exists. Roles, trainings, credentials, and services vary widely across programs and countries. This report calls for HRH stakeholders to create a common definition of CHWs along with an agreed-upon set of core tasks and competencies, using the ILO definition as a guiding framework. To enhance the quality and availability of data for decision-making this report also calls for the creation of guidelines for a minimum data set of information on CHWs and the creation of national registries integrated into national human resources information systems to house this minimum data set..
CHWs provide critical health services to populations that lack access to services at health facilities. Well-trained and supplied CHWs can have positive impacts on health, but little is known about the adequacy, cost, or effectiveness of training models to prepare CHWs. 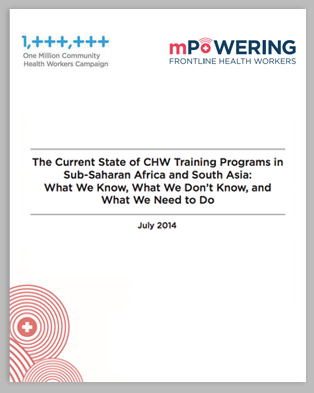 This report analyzes key pieces of literature on CHW training and provides recommendations and next steps on how to improve CHW training. 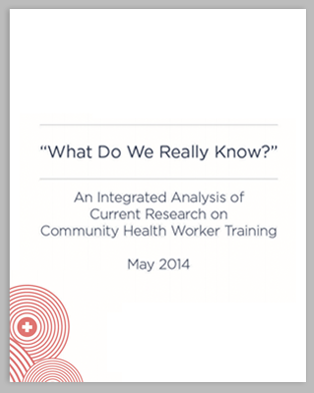 Although CHW programs are prevalent, little formal research has been conducted on CHW training programs or their effectiveness. To begin to address this a literature review was conducted to curate research regarding CHW training programs and curricula. This literature review identifies, synthesizes, and analyzes a wide body of literature related to CHW training in sub-Saharan Africa and South Asia. There is an great need for CHW operations data that is readily available for governments and organizations to use for human resources for health (HRH) gap analysis and planning. It is challenging for governments and NGOs to identify CHW coverage and capacity, level of training, and resources available. This report summarizes the results of a survey measuring the efficacy and use of the Operations Room v1.0, a platform that establishes a clear view of CHWs deployed. 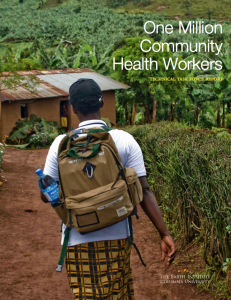 During the past 10 years, community health workers (CHWs) have emerged as a focal point of international discussions on primary health-care systems. Although lay community-based health workers have been active for at least 60 years, the Millennium Development Goals (MDGs) in 2000 prompted new discussion of how these workers can help to extend primary health care from facilities to communities. CHWs have since been part of an international attempt to revise primary health-care delivery in low-income settings, and CHW programmes have been changed accordingly. To help sub-Saharan African countries achieve universal health coverage (UHC), countries across sub-Saharan Africa need to train, equip, and deploy one million community health workers, each serving an average of 650 rural inhabitants. 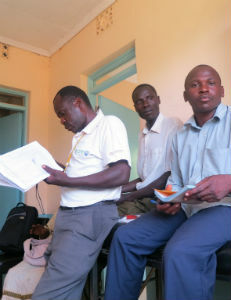 With the use of the latest communications technology and diagnostic testing materials, these frontline workers will become the link between the rural poor and the broader healthcare system of doctors, nurses, hospitals and clinics. This factsheet provides a basic overview of the Campaign’s approach, principles, and recommendations. In response to widespread recognition of the need to scale up community health workers as a part of primary health systems in sub-Saharan Africa, this technical report was prepared to consolidate scientific and implementation experience in a series of recommendations and guidelines. The development of this report was a collaborative effort with input from scientific experts, led by the Earth Institute at Columbia University in support of the United Nations objectives to achieve the Millennium Development Goals.